Whether you’re buying a new home with an existing well, or drilling a new well, an important question to ask is “how much water does the well yield?” The real estate agent or owner says it yields “X” gallons per minute… how accurate is this number? How do I know how the well will perform when there’s a drought? What about water quality? How do I know whether or not there are impurities or contaminants in the well? The answers to these questions can only come through properly designed testing of the well. Testing should include a pumping test, sometimes referred to as an aquifer test, to determine the yield or flow of the well, and water quality tests that determine whether or not harmful bacteria or chemical contaminants are present. First, a little background: In most states, water well drillers are required to file a Water Well Completion Report with a state agency (in Virginia, with the local Health Department) after a well has been constructed. One of the pieces of information reported on that form is the “yield” of the well, which is commonly expressed in gallons-per-minute. This is the number that is commonly cited as the amount of water a well is capable of producing. While this number is generally a reasonable approximation of how the well will perform under use, it could be hugely in error for some wells. This is because there is a difference in how a well performs when water is being blown out of the hole with compressed air right after the well has been drilled, as opposed to removing the water with a submersible pump after the well has “recovered” from the drilling process. The physics of removing water from a well by blowing compressed air down the hole are very different from the physics of pumping water out of the well with a pump. The sustainable yield of a well is the amount of water that can be pumped from the well continuously over time without causing damage to the well (too much drawdown) or causing the well to go dry. A pumping test is the only way to get a good approximation of sustainable yield. There are several approaches to conducting a pumping test. In one commonly used test, the well is pumped over a period of time while water levels in the well are recorded. Pumping rates are adjusted as necessary such that water levels in the well stabilize at 50% or less drawdown over the duration of the test. After a set period of time the pump is turned off, and the water levels are recorded as groundwater flows back into the well during the recovery phase. The rate at which the water level in the well drops relative to the pumping rate, the amount of drawdown the well displays for a given pumping rate over time, and the recovery rate provide the basis for calculating sustainable yield. Generally the longer an aquifer test is run, the more reliable the data. Aquifer tests on large-capacity commercial or public water supply wells commonly span several days from beginning to end. However, it is usually possible to get a reliable estimate on a modest capacity domestic well in a test spanning 2 to 8 hours. The costs for aquifer testing are roughly proportional to the duration of the test. Pumping test in progress on an old agricultural well. 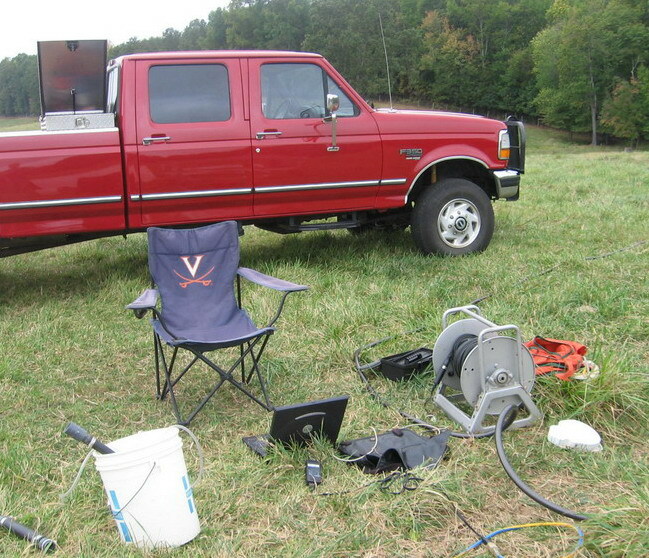 Laptop computer (in front of chair) is connected to pressure transducer in well that continuously records water levels as the test proceeds.